No new maneuvers this morning, but a lot of consolidation practice--slow rolls, four-point rolls, eight-point rolls, loops, and loop-to-roll combinations. I managed to do some loops and rolls completely without any coaching from Greenwood. They weren't good loops and rolls, but they were at least recognizable, and a couple turned out pretty well. He said I'm making progress. I said I'm having fun. 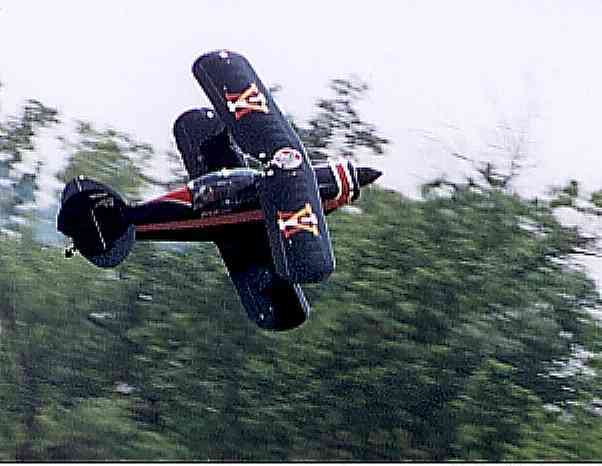 at an airshow in Maryland, 1997. Those are Virginia Military Institute "VMI" insignias on the top wing. You can see John's head (grey hair with headset) at the rear end of the canopy, just forward of the red triangle. This picture has the jaggies because I doubled the size of the original image, sharpened it, and increased the jpg compression. He told me today that when he's doing knife-edge flight in an airshow, he likes to stay below 35 feet and let it dip a little--"to thrill the crowd," he said. He looks a little high here, and not quite knife-edge yet. You can see why these things are hard to taxi. All you can see ahead is fuselage and the cowling over that big engine. The prop seems almost as long as the wings--although of course it's nowhere near 20 feet long! The Pitts is about 17 feet from front to back. 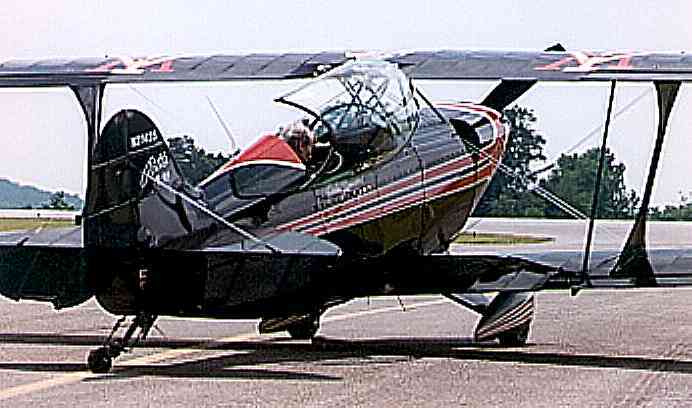 The dark thing just forward of the tailwheel strut is a drain tube for the engine oil header tank. (I think that's what it's called.) When you fly inverted the engine oil is contained in or passes through this header and--though I'm not sure why--some of it ends up dribbling out the drain tube after you're back on the ground. John keeps a little blue enamel basin under it in the hangar to catch the somewhat frothy green drips.